As I spoke, I started to move objects off of our beautifully set communion table. First, the fresh cut flowers from Annie’s garden, daffodils. I next move our cups to the floor—one a clear, glass wine glass and the other a ceramic martini glass painted bright yellow with bands of green and red around the rim and base. I lift our clear bulbous pitcher filled with rich red grape juice and set it on the floor. 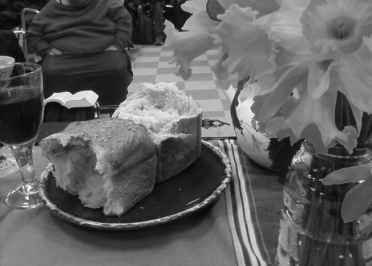 Next I take our round brown clay plate, moving it and the stale loaf of sour dough bread sitting upon it, to the floor. All that is left on the table is a blue and yellow plaid table cloth picked out from a local clothing closet, two stoles decoratively draped over the front of our small communion table—one woven in Guatemala, the other made of a rich yellow and black kente fabric from Africa—and a thin, rectangular fabric on which a picture of the Virgin of Guadalupe is painted. I lift the edge of our fragile, teetering table and let it fall with a clatter to the ground—fabric splayed and legs in the air. Nervous murmurs and giggles hang in the air. “Let us not allow this to become an empty ritual for us. Let us not gather round this table then walk out that door and do violence to one another! Let us not gather round this table and offer to one another “the body of Christ and the cup of salvation” and walk out that door and gossip about the hardships of others!” I feel my voice rising with each word. I see Tom, a faithful member of our community, start to move toward me. Tom kneels in front of me with his hand in prayer, muttering something. He sets the table upright. I get it. It is uncomfortable to see the Lord’s table knocked over, somehow disrespected. But then again, that is the point. With a crash, I flip it over again. Before I can open my mouth again, Tom bends over to set it right. “No,” I say. He ignores me and puts it on its feet. He starts to argue with me, I am sure he’s heard nothing I have said. “You are missing the point,” I say, my voice already raised. “Can he not see that he is ruining my moment?” I think to myself. Oh, wait. I forgot. It is not about me. He yells something at me in Italian, which he is apt to do when he is really irritated, and turns to walk out the door with a dismissive flick of the wrist. I feel flustered. My eyes turn to the rest of the community as my neck starts to turn red. In a flash my behavior feels anything but loving—and not even remotely pastoral. I am embarrassed. So I continue, “And this, sisters and brothers, is why we must return to this table every week. My brokenness has been laid out before you on this overturned table. We are all broken. This table offers us nourishment as we seek that difficult talk of changing our hearts and lives, serving God and one another. Jesus’ story does not end with an overturned table. It begins there. In the next two chapters we see Jesus engaging in long conversations with broken people—Nicodemus who comes by the cover of night so as not to be seen by others, and the woman at the well who drew her water in the heat of the afternoon so as not to encounter those who despised her. His irritation with people and with systems is not enough to leave them deserted, he shows his love with his time and interest. Each time we come to this table, we take time to worship God in community, we reengage conversation with Jesus and one another because we hurt one another. I beg your forgiveness for my brokenness and raising my voice at Tom. Before I take communion today I will seek his pardon too. “Living in community is messy! We do not always get it right. But ultimately, this place of offence—where money changers gorge the prices of an offering, where some gather to eat while others go hungry—becomes a place of reconciliation—where Jesus offers us his brokenness to mend ours, where all of God’s children are fed. “God offers us simple gifts of wine and bread at a simple table so that everytime we take a sip of a drink or a bite of food, we can remmeber our call to do acts of mercy. This feast is meaningless if we do not show our love for God through our actions. And, thankfully, when we fail, we can get nourished at this table and fortilize ourselves to try again the next week. Thanks be to God!